In 2008, Barack Obama carried 365 electoral college votes against John McCain, roughly on par with the 379 electoral college votes Bill Clinton carried against Bob Dole in 1996, and 1 of the largest electoral college victories since George H. W. Bush trounced Michael Dukakis in 1988, 426-111. But according to Public Policy Polling (D), when voters are given Hillary Clinton as a hypothetical presidential choice for 2016, she would win in a landslide at least larger than Obama's in 2008 and her husband's in 1996, and at most, would rival FDR, Richard Nixon, and Ronald Reagan for 1 of the largest landslides in history. A string of recent 2016 polling from the prolific Democratic pollster indicates that Hillary Clinton would be, by far, the Democrat's strongest candidate in a generation. 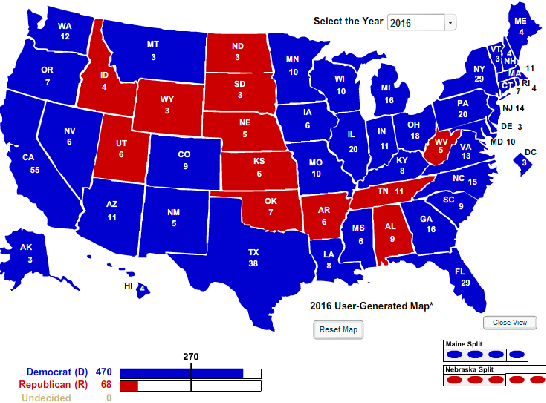 In states as traditionally conservative as Alaska, Texas, Kentucky, Louisiana, and Georgia, Hillary would tie OR defeat every single one of her potential Republican rivals. This fact is far more astounding when you consider that Barack Obama lost all five of these deep-red states in both 2008 and 2012, by no less than 8 points (in Georgia), and no more than 23 points (in Kentucky). Furthermore, Kentucky & Louisiana have not voted Democratic since 1996, Georgia since 1992, Texas since 1976, and Alaska since 1964. 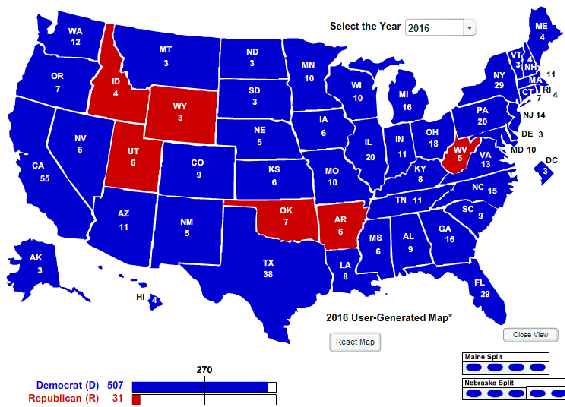 As you can see, the electoral college map turns the blue-est its been since 1964, when Lyndon B. Johnson won a landslide 486-52 victory against Goldwater (R) in the wake of John F. Kennedy's assassination. In fact, Hillary's 470-68 lead, if played out in 2016, would be the 7th largest electoral college victory of the last 29 elections, dating back to 1900. It's amazing to think that the former GOP punching bag of the 90's could win more Republican states than her folksy, charismatic husband ever did. But that is exactly what PPP is finding at this early stage of the 2016 race. 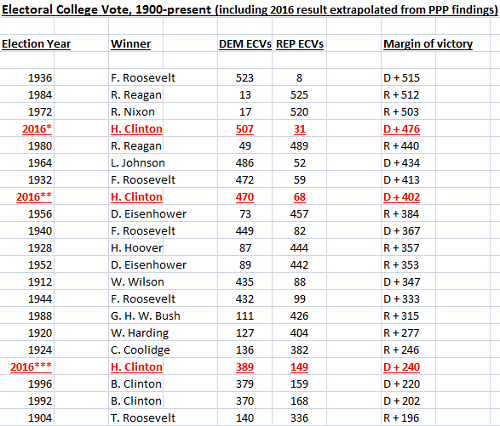 Not only that, if Hillary were able to win Kentucky (as PPP finds), and other states that Obama lost by similar margins or less, she would be poised to win over 500 electoral college votes, something accomplished only 3 times over the course of 29 elections since 1900. If all of this sounds a bit optimistic...that's because IT IS, especially when you consider how confusing some other PPP findings are regarding the 2016 presidential race. Of course, any measure of an election that is still four years out should be taken with a grain of salt. But PPP is finding a pretty amazing electoral scenario shaping up for Hillary Clinton. Unfortunately, they are one of the only pollsters in the field doing hypothetical 2016 general election match-ups in typically safe Republican states. It will be interesting to see if other pollsters find America on the verge of "HillaryLand" in the weeks and months ahead. 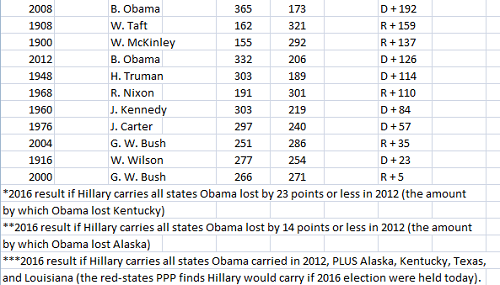 UPDATE; 2/23/2013: PPP just released 2016 numbers in the state of Montana, which becomes the 1st "red-state" to show Republicans....actually....beating....HILLARY! Rubio leads 50-42%, and Ryan leads 51/44%. 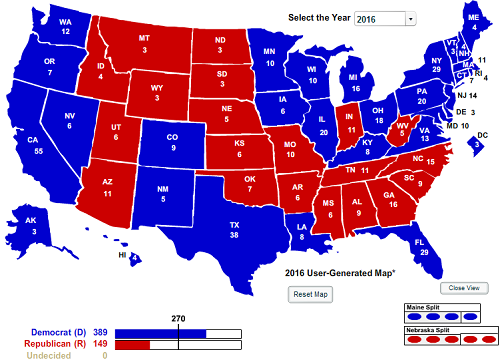 So subtract blue Montana from the map above (all 3 electoral college votes). 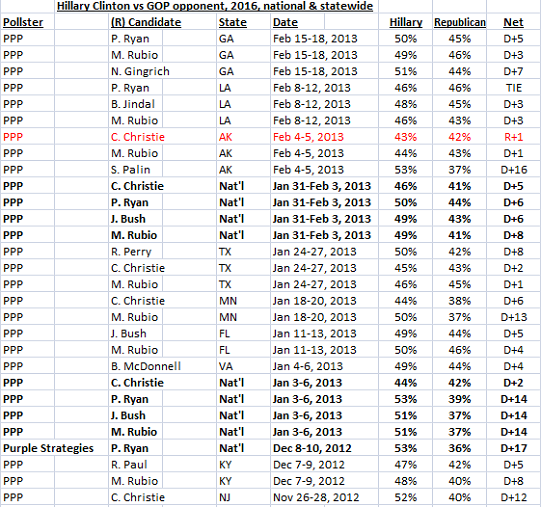 Hill's still impeccably positioned for 2016 (per PPP findings). I hope she doesn't win. Agreed, hillary would be a catastrophe. This is wishful thinking. Of course Hillary is leading in the polls because no one else besides Jeb Bush and Mitt Romney have actually declared they are running. With Obamas approval rating, and questionable scandals surrounding Hillary it is more then likely she may be knocked out of the race before the nominee is officially decided. Dont rule out the possibility of Elizabeth Warren entering the race just to take votes and make Hillary seem less crazy in comparison. Keep in mind Obama's election was special. (And I am no fan of Obama.) She will not have the same amount of enthusiasm behind her that he had going for him. January 30, 2016.... Hillary... "you've come a long way, Baby !!" God Bless Hillary Clinton. 98% of Latinos are voting for Hillary. 3 millions new latinos are voting for hillary in texas. Donal Trump is the DEVIL. Obama is going an Excellent Job, you just don't want to give him the credit because he is 50% black. but he has done a very good job and thats the reason we the latinos whether you like or don't are going to vote for Hillary Clinton as the next President of the United States of America. so, if you are voting for Trump you are wasting your Vote. Vote for Hillary and be part of the celebration. jajaja!!!! Obama is doing and Excellent Job. Stephen Moore’s Columns Deriding Women Raise New Questions for Trump Fed Pick - Mr. Moore’s past columns and appearances contain potential roadblocks to confirmation — including a history of writing about women in unflattering terms.